Can the Gunners stop Gomis from scoring again? The disappointment from the Capital One Cup is now behind us and the manager has more or less finalized his options for the right flank with Joel Campbell and Alex Iwobi labeled as the replacements to use. As I discussed in yesterday’s post, I felt that Campbell was the best option because playing him there wouldn’t cause any disruption to the team tactically. Swansea is a team that has bested Arsenal in recent times and they were the only team to do the ‘double’ over the Gunners last season. The head to head record between both sides is even equal with Swansea beating Arsenal six times, the Gunners winning six times and the spoils have been shared just twice. However, the Gunners have an edge as they had won nine of their last 11 away games and they have the best defensive record in the league with only eight goals conceded. “Arsenal have an excellent squad, the bigger squads can afford injuries like that. That’s the difference, it would hit us harder if we had those injuries but they have the strength and resources to cope. They look like title contenders, they’ve had a fantastic start to the season. A lot has been made of them from January onward and the form they’ve been in, they are title contenders. Arsene Wenger has confirmed the absences of his English attacking duo, Theo Walcott and Alex Oxlade-Chamberlain, till after the international break, so he has a rather thin squad to work with. However, most of the first team regulars got breathers and should be fresh for today’s game. There is also a quest to find the player that would score Arsenal’s 2,000th goal under Wenger. When he was asked about the potential player that would score the goal, Wenger nominated himself! What a classy dude. With his team exiting from the Capital One in the third round, Garry Monk has a squad that has rested in the course of the week. He’s more or less expected to select the same squad that ended their five-game winless run in the League with a victory against Aston Villa. Garry Monk’s side is without a win in three home league games (D2 L1); its worst run since last February (also three games). The club has never gone four without a victory at home under their current boss. But the manager would be looking to Bafetembi Gomis to get the goods once again for the Swans against the Gunners as he scored the match winners against Arsenal home and away last season. After scoring four goals in his first four games, Gomis has gone through six games without a goal and he would be hoping to rediscover the form that made the team sell Wilfried Bony would batting an eye lid. There are no injuries for the Swansea squad. Download the Gooner Daily BlackBerry App to receive notifications on your Smart Phone when a post is published. 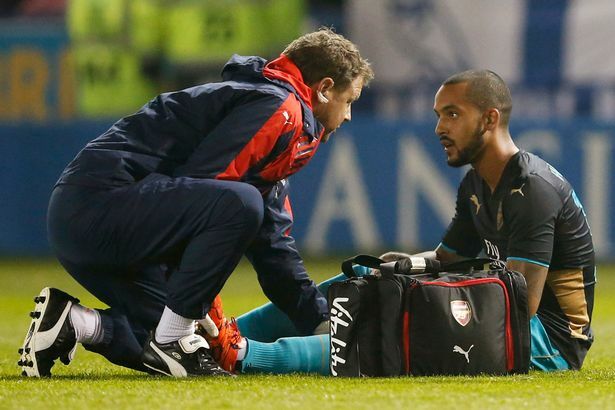 Arsenal Injury Crisis: Who Will Be Our Lucky No. 7? Is he up to the task? In my years of supporting Arsenal football club, I have seen the team go through a whole lot. One of the norms an Arsenal fan faces season after season is the usual tales of injuries that plagues the squad but the challenge has always been – are the replacements good enough? In the 10/11 season, Thomas Vermaelen suffered a nasty Achilles injury that sidelined him for months and he was replaced by Johan Djourou. In fairness to the Swiss defender, he put up a great shift but when he was made to provide cover as an auxiliary right back when the Gunners had a fullback injury crisis in the 11/12 season, he struggled badly. In a strange twist of fate, the Gunners lost Andre Santos to an ankle injury, Kieran Gibbs went for a hernia operation, Carl Jenkinson had a back problem and Bacary Sagna broke his leg. Just great innit? The injury gods have ravaged Arsenal yet again this season and a squad that looked really deep at the start of the season, which was one of the reasons the manager didn’t invest this summer, has become so depleted, even to the point where we have doubts on the player that would start on the right wing in tomorrow’s clash with Swansea. Alex Oxlade-Chamberlain began the Community Shield on the right wing but he lost his place in the side to Aaron Ramsey that started playing in that position in the tail end of last season. Both players are currently injured. Then there’s Theo Walcott that played more or less his entire Arsenal career on the right wing before he was converted to a center forward very recently. Walcott, errrrr, is injured. There are some players that have featured on the right wing at some point in their Arsenal careers, such as Jack Wilshere, Tomas Rosicky and even Danny Welbeck but sadly, they are crocked as well. Serge Gnabry would have been a player that would have gotten another chance in the squad but sadly, he is rotting in the dungeons of West Brom’s bench. This leaves Wenger with a couple of options – playing Alexis Sanchez on the right wing, trying out Santi Cazorla on the right wing (he has featured there before), moving Hector Bellerin further forward, giving a chance to Alex Iwobi and finally, giving Joel Campbell an extended run of games. Each of these options are plausible but they all have tactical implications. When Alexis Alexis joined the club last season, he played on the right wing while Mesut Ozil played on the left. This was to accommodate the Ramsey-Wilshere axis in the middle. If Wenger opts for Alexis on the right wing, he would need to draft in a new left winger, and this would be disruptive to Arsenal’s attacking play, because we build up many attacks through Sanchez on the left. He cuts inside and has a good shot on him, and it’s always good to play to the strengths of one of the best players in the team. As we all know, Cazorla is one of the most versatile players in the team and he has featured in several positions in the starting XI but his new role as a deep-lying playmaker is very vital to the team. His ball retention skills are second to none and he is always available for a pass, as well as knowing fully well what to do with the ball when he receives it. He also offers some protection to Francis Coquelin, and he is a good tackler of the ball. Pushing Cazorla to the wing will be detrimental to the team because of the amazing shift he’s putting at the moment. The fact that Mikel Arteta is injured doesn’t make the idea plausible. The discovery of Bellerin was a revelation last season and he has picked up where he left off this campaign, shoving Matt Debuchy further down the pecking order. With Ramsey drifting infield, Bellerin has played like a modern-day Dani Alves, marauding the right flank as a fullback and pseudo-winger. He is confident in taking on his markers and he has a very good delivery on him. Wenger can go all ‘Eboue’ on him by pushing him further forward, thereby allowing Debuchy to play behind him but with the Frenchman in such a dire run of form, Wenger might not want to take that risk – especially with the class of opposition the Gunners are playing in the coming weeks. Alex Iwobi has some talent in there but as Wenger said in the wake of the defeat to Sheffield Wednesday, he and his fellow youngsters are not ready. He showed off his fancy footwork against Sheffield Wednesday but he failed to make any significant impact on the game. Many Arsenal fans have their opinions about Joel Campbell but in the current situation, deploying him on the right wing seems to be the most plausible option because there would be no major tactical changes with his introduction. He may not be the most talented player in the team but he puts up some effort and he can show his worth with an extended run of games. That wasn’t a double right? In conclusion, it’s actually Arsene Wenger’s problem, not mine but I trust the boss to make the best decision for his team. As they say in this part of the world – Arsene Knows Best. The Capital One Cup Round of 16 fixtures were completed yesterday with Middlesbrough cementing their status as giant killers in the competition yet again as they went to Old Trafford and earned themselves a victory over Manchester United. Elsewhere, Jurgen Klopp finally got his first victory as Liverpool manager with a narrow win over a Bournemouth side Brendan Rodgers couldn’t beat in the Premier League. Manchester City was the pick of the bunch with the Citizens running riot against Crystal Palace and Southampton edging past managerless-Aston Villa. In addition to Tuesday’s results that saw Everton, Hull, Stoke and Sheffield Wednesday emerge victorious, the draws for the quarterfinals would create an interesting prospect but Arsenal’s participation in this season’s tournament is over. Arsenal fans are more concerned about the fitness of Alex Oxlade-Chamberlain and Theo Walcott as they suffered injuries in the loss to Sheffield Wednesday. 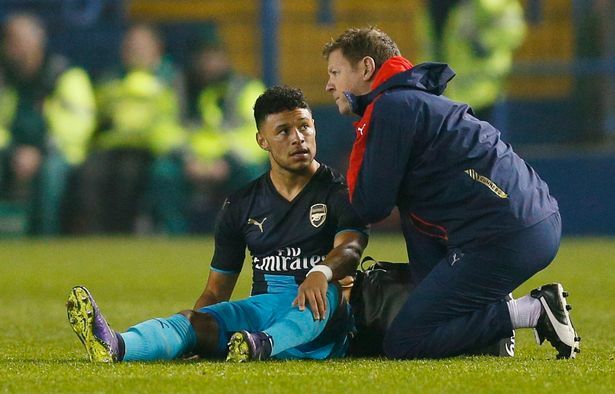 Prior to kickoff, the Ox was seen performing a stretching routine and it was no surprise when he was seen on the turf for seemed to be a hamstring injury. Walcott replaced the injured Ox and added to Arsenal’s woes as he spent barely 10 minutes on the pitch before suffering what is now reported to be a calf injury. With Arsenal having all-important fixtures against Swansea, Bayern Munich and Tottenham before the international break, it’s quite saddening to know that Arsene Wenger would be without his English forwards, as the Mirror has confirmed that they are set for a lengthy layoff. With Walcott and the Ox out injured, the Gunners injury list is piling up yet again as the Englishmen are set to join Jack Wilshere (ankle), Tomas Rosicky (knee), Danny Welbeck (knee), Aaron Ramsey (hamstring), David Ospina (shoulder) and Mikel Arteta (ankle). Wenger can ill-afford any more injuries to the squad because it’s getting heavily depleted and the team is walking on a thin thread on several positions. Petr Cech is the only available goalkeeper for selection with Ospina suffering a shoulder injury. If Wenger couldn’t trust Matt Macey with a game against Sheffield Wednesday in the Capital One Cup, do you think he would get any minutes in more important competitions like the Premier League and Champions League? I think not. With Walcott injured, the Gunners will lay all their striking eggs on an Olivier Giroud basket. The Frenchman responded well to spending some time on the bench with three goals in a week and he would be hoping to continue his scoring streak even though he hit blanks in Hillsborough due to lack of service. Walcott has proved that he’s a capable center forward and we would be waiting to see how he would respond to Giroud’s upturn in form. This competition is beneficial to the team and I hope it continues as both players do their bit to prove their worth to Wenger. As for Oxlade-Chamberlain, I feel sad for him because he hasn’t fully convinced this season. Yes, there was the great goal against Chelsea in the Community Shield but he has failed to maintain that consistency and Wenger didn’t bat an eyelid in playing Aaron Ramsey out of position ahead of a natural winger like the Ox. With Ramsey suffering a hamstring injury against Bayern Munich and Arsene Wenger playing Walcott as a center forward, the way was paved for the Ox to get an extended run of games. I wish them speedy recoveries from their muscular injuries.